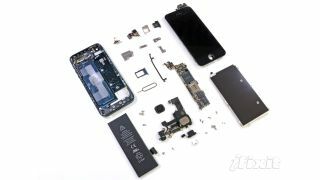 It's barely hours since the iPhone 5 went on sale and iFixit has already completed its now-traditional teardown to reveal the handset's juicy innards. The site awarded the new iPhone a repairability score of 7 out of 10, reporting that the easily smashable glass screen is also easily replaceable (it takes just one step to get the iPhone 5's screen off, compared to 38 repair steps on the iPhone 4S). The other major iPhone 4/S annoyance is the relatively short life of the home button; iFixit says the new version comes with "an integrated metal support bracket, which we hope will greatly strengthen the oft-used switch". Other interesting titbits uncovered by the teardown include news of a larger, higher-voltage battery in the iPhone 5, most likely made by Sony. A number of companies have a hand in the iPhone 5, in fact, including Qualcomm's power management chip and modem and a Texas Instruments touchscreen chip. The downside is that the handset is still quite tricky to get into thanks to Apple's penchant for Pentalobe screws, and the site reckons repair cost of a lot of the smaller components will be quite high because they're all soldered to one ribbon cable.